Home from Potfest. I’m pretty exhausted but of course my brain is in overdrive – again. Just had a hot soak in the bath and some food. It’s been a weird weekend. Some great parts, sales wise it started off great but didn’t manage to keep that momentum unfortunately. It’s been a bit demoralising the last couple of shows. I’ve been working so hard and I felt that I had the best pots I’ve ever made. I was really excited about showing them and pleased with how they looked on my stand but now I feel very different. I know it’ll all be better after a good night’s sleep. I’m not entirely sure what to do next though – other than sleep. 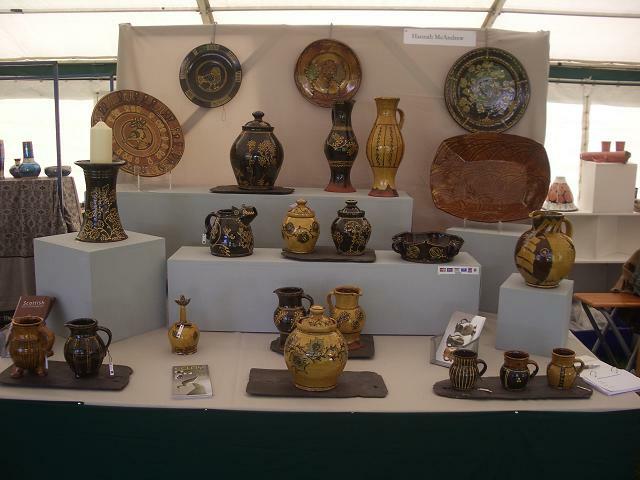 The great bits though were meeting so many people that I know already, both potters and visitors. 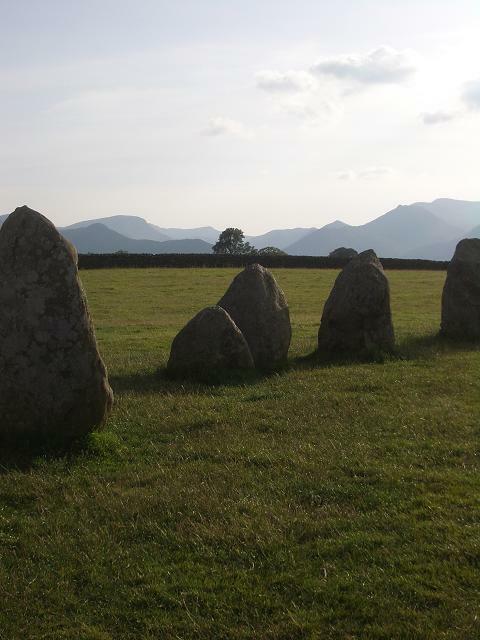 Saturday evening saw a few of us visit Castlerigg stone circle near Kendal. A lovely evening for it, then a pub meal before heading back to the camp fire fun which I bailed out of being my usual muppet self. Small groups are great, bigger groups are maybe just not my thing. 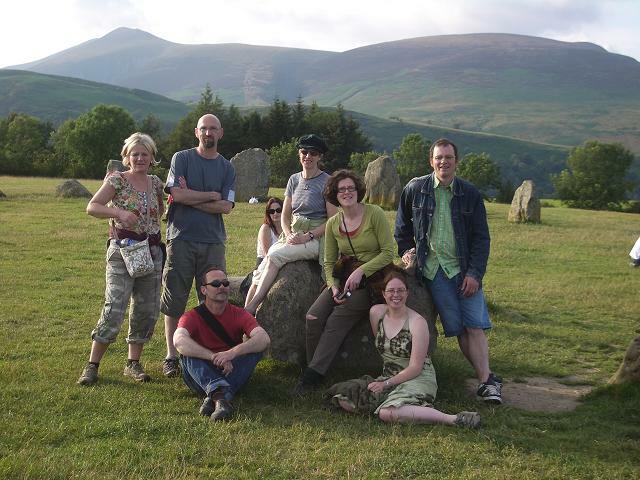 From the left: Rachel Wood, Paul Smith, Paul Young, Christine Smith, Kathryne Winfrey, me, Dylan Bowen. This entry was posted in Potfest. Bookmark the permalink. A wise man and good friend gave me a book on Michael Cardew. In it, he wrote: 'Trust what you know', before signing his name. The same applies to you and your show. You know how good your work is and the only standards you need to go by is your own. Good people appreciate quality – they know. sorry if all I could afford was a mug, James Hake only managed to see me buy an incense stick holder.Your stand did look great and stood out from a lot that was there. I love the dragon jug but I am surprised my wallet managed to stretch to as much pottery as it did.Back to job application forms in the morning, and sending off some invoices and hope I get paid soon, for the work I have coming as a potter. Nancy is absolutely right re: quality.Sales go up sales go down.I would not make any big changes unless I was consistently doing worse than my peers at the shows,and then I would look at changing my marketing or merchandizing before I changed work as nice as yours. Hope a good rest helps. I fell ya girl! The last show I did, I made $40 and I know my stuff was better than the air brushed personalized toilet seats that seemed to be selling so well! Of course, I should have known better than to be at that show in the first place. Oh well, we live and learn, no one has any money right now except the Republican congress in the good old USA! Chin up, your work is beautiful and if anyone had any money they would be buying it all up. It's not you, it's the world! Hannah, your work is lovely, as usual.I've been struggling with shows all summer here in the US,feeling like my work is not appreciated.I am rethinking all the work that goes into these craft/artisan fairs and thinking about specific locations.My Dad always says,"No one ever said it was going to be easy",and that is holding true.Believe in your work, and "Trust what you know". Your work is wonderful.Inspiring and beautiful.Only you can produce what you do- stay true to it…sometimes people just don't buy,doesn't mean they don't want to buy or don't look and decide to save up for next time..it can be grim selling your own stuff, it all gets very personal!